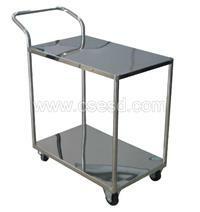 Product Name: Anti-static Trolley Product Information: Features of stainless steel Product Information: Features of stainless steel of the Anti-static Trolley: resistant to atmospheric cor: resistant to atmospheric corrosion, steam, water and other weak corrosive medium and resistance to acid, akali, salt and other chemical rodent medium, also called stainless acid-resistant steel. Product Information: Features of stainless steel: resistant to atmospheric corrosion, steam, water and other weak corrosive medium and resistance to acid, alkali, salt and other chemical rodent medium, also called stainless acid-resistant steel. In practical use, the stainless acid-resistant steel is usually called stainless steel, while the steel of resistant to chemical corrosion medium is also called acid-resistant steel . It is smooth, safe, hard, beautiful, durable, assistant to acid and alkali. It is used in the laboratory and other dust-free and corrosion-resistant work environment. Function: The stainless steel is one of the hardest material of the metallic building material. Because of its good corrosion resistance, the stainless steel can keep the project design’s integrity of the structure components. Chromed stainless steel involves the mechanical strength and flexibility, which is easy to produce, to meet the architect and structure design workers’ requests. Stainless steel products: It is widely used in the electronics, machinery, chemistry, electricity, aerospace, military industry , shipping, transportation, architectural ornament and other fields. Production: Anti-static production line, photocopier flexible production line, digital camera assembly production line, projector flexible production line, motorcycle engine assembly production line, automobile assembly production line, automobile air-condition assembly production line, computer host assembly production line and other electron products production line. Worktable: multifunctional anti-static worktable, computer desk and monitoring worktable and general worktable; Material Shelf: storage shelf, mobile rack, rollock shelf, pull-out shelf, FIFO shelf and various anti-static trolley, handcart, tool car, test trolley, platform lorry, multilayer trolley. Remarks: The size and style are available for customizing.